Because it is so good for you, I wish I could tell you that fish was one of my favorite foods, but the truth is for years I forced my self to eat it every so often. I could eat Tilapia or Orange Rough but that was about it. I love raw salmon but could never find a way to eat cooked salmon. I kept trying it because it is so good for us. Our friend and third daughter, Heather, ate it all the time and convinced me to give it one more try. Well, she was right, I love it now. (It is the new favorite dish at our house) The key for me is to not overcook it and the seasoning. Below is the easiest and bestest (I know it is not a word, but it is in our house) Salmon recipe. 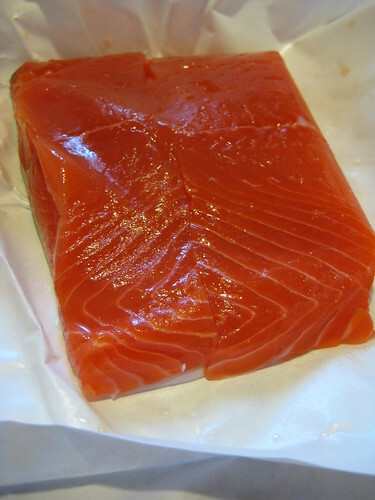 Salmon filet Ask the fish monger (don’t you love saying fish monger) to take the skin off for you. I serve this with wild rice or on top of a salad. I always make extra for the next day. It is great cold or reheated. You’ve probably heard a lot lately about omega-3 fatty acids. It’s the stuff that makes salmon and some other fish so good for us. “They’re good for the brain,” said Sue Moores, a dietician with the American Dietetic Association, adding that omega-3s may improve heart health, brain health, fend off cancer and arthritis and reduce inflammation in our bodies. Plants are another source, leafy greens, flax seed and walnuts.